Be Social. Socialize with your fellow travelers. The same things that drew you in probably spoke to them as well. So there’s a good chance you have a lot in common with the people traveling with you. Plus, think about how much more enjoyable your vacation would be with someone to talk to. Know our information. Make sure you keep the hotel information handy. We equip you with directions in the local language in case you need it. Also, in addition to using the group chat, try to exchange numbers with a couple of people in your group. In case you’re lost or have some type of emergency, it’s good to have multiple ways to reach someone. Be adventurous, but not foolish. We find comfort in trying new things with a group. It’s honestly one of the best parts of a group vacation! Just remember what your personal limits are before any activity. Don’t risk your well-being for the sake of seeking adventure. Stay in tune with yourself. Don’t add pressure of feeling like you have to “go with the flow of the group”. During downtime, if most people want to grab a meal, but you really want to go for a swim, it’s ok to go for a swim! It’s your vacation too. Do what feeds your soul. Alone Time. In line with staying in tune with yourself, we actually recommend alone time. One of the beauties of traveling is discovering more about yourself. 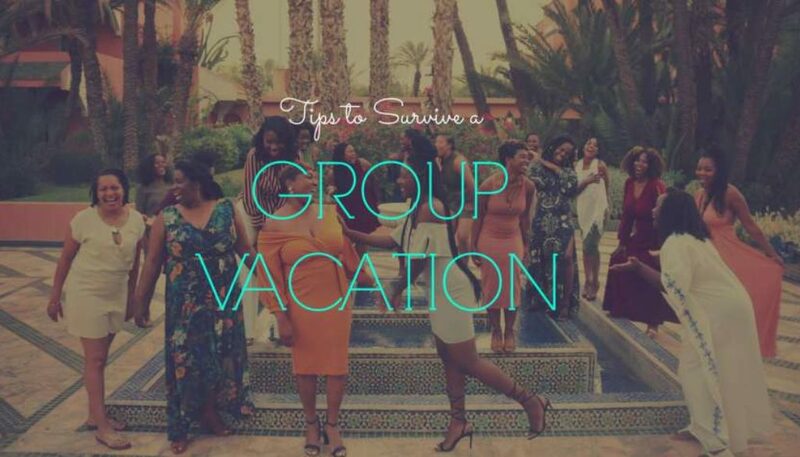 Set aside alone time away from the group to unwind and reboot. Adjust your internal clock for group activities. It’s important not to be the person that holds the group up. Be real with yourself. If you normally run about 10-15 minutes late, adjust the start time in your brain, making it 10-15 minutes earlier to ensure you’re always on time! Contribute your thoughts. Don’t be afraid to speak up and contribute your thoughts and ideas when in a group setting but, also be able to listen to others in order to communicate effectively. Be Open-minded. Traveling with a group allows you the opportunity to meet people from all walks of life, approach diverse situations with an open mind and be willing to learn and try new things.